Another piece of Hackney Wicks history disappears under the all enveloping Olympic Juggernaut! Love it - or loathe it - the Gainsborough School footbridge has gone forever. Leabank Square was almost evenly split on this removal. Most of the younger residents have fond memories of their classes traipsing through the concrete tunnel - from their playground - & onto the Arena Fields. There - they would either do sports, art classes, nature spotting or just eat their sandwiches. Most of the older residents began to see it as a bit of an eyesore - let's face it - it wasn't ever beautiful. And when we put a request in a few years ago to plant the hanging gardens of Hackney Wick draping from it's roof down towards the river - we were told it had just been sold to the Olympic Delivery Authority. Anyway - after a few false starts - (and delicious cakes, pasta bakes, olive & onion bread, teas & coffees) these pictures capture it's final few hours. If anyone else has any other pics - please email them to leabanksquare@london.com and we can get better ones up here. Air Ambulance in Leabank Square!! There was quite a drama here during the week when London's Air Ambulance landed in Leabank Square. When we still had Arena Fields over the river, the Air Ambulance used to land there all the time when there was an accident on the A12. But then the government sold it to the ODA - and now they have to use the green in the middle of our square. Of course we welcome it wholeheartedly - and hope that the patient makes a speedy full recovery. And how about this excellent idea put forward from Colette!! For far too long now we have had the unsightly viewing of the bin areas, re-cycling bins, re-cycling buckets the terraces have to put out in front of their doors, etc - to look at. Let's face it - they will never be the most attractive part of Leabank Square to see. What Colette suggests is that we build beautiful wooden structures around them all - and hide them behind with lovely flowers on top of them. Not only will we hide the unsightly parts of the Square, but we'll be able to have more space for stunning flowers!! you will have noticed that I have been making small steps towards the completion of the Leabank mosaic (with thanks to my new friend Jackie). I would love to make the weekend the final stage and would like to invite all of you to come along and help finish it. I will provide hot chocolate and buns if the weather is awful and cold drinks and sun cream if it changes! Lets make it a fun community thing to do. See you by the bins at 2pm? Wear gloves and old clothes although I have some gloves and aprons. We also need some interesting things to stick in the "square" part so if you have anything bring it along. A special thank you to the kind donor of the lovely palm tree ceramics which you left by the wall. Congratulations to all who turned out for the BBC at 6.45am on Friday!! As you all know - this is the beginning of the current campaign, and we really had a great turn-out!! Only sorry that the BBC didn't use everybody, but we are in very early days yet, so everybody will get a shot at the media campaign!! For those of you not home on Friday - please go to: http://news.bbc.co.uk/1/hi/england/london/7675496.stm to catch up. A massive thank you to everybody involved!! Remember - anyone is welcome to contact the Olympic helpline if they so wish - but if you want to be part of the new anti-Olympic campaign - please email leabanksquare@london.com and we'll let you know about the meetings. Time Out Letter Of The Week!! Remember that letter we wrote to Barack Obama? Well - it won Letter of the Week in Time Out Magazine!! Not only that - but it was also chosen for publication in the East End Advertiser!! Well done Leabank Square!! 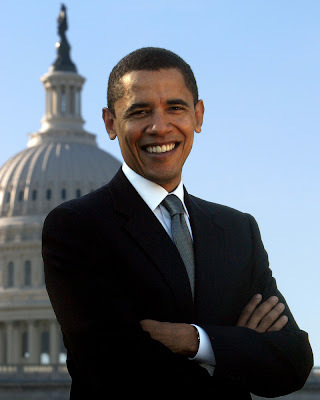 Now all we have to do is wait 4 more years to meet President Barack Obama!! Work on the Olympic site has now been brought right up to the neighbouring fence - and we can see all sorts of activity going on only metres from us. Of course this has brought fresh concerns from most of the Square - especially from the front 3 blocks. The noise at 7.00am hits you like the rudest alarm clock - and does not stop until 8.00pm. The new floodlights set up around the soil washing plant bring daylight into our flats at night - and encourage the builders to make as much noise as they do during the height of the day. We are back to debating the old question: Is having the Olympics on our doorstep - worth living next to the largest construction site in Europe? The answer used to be yes. But now we know a lot more about the Olympic Legacy. We know that the leisure pool that was going to be attached to the racing pool has been scrapped. Those of us that had lobbied for just such a pool to introduce the East End kids to swimming - while seeing the older swimmers training & racing right next door - are very disappointed. We know that no serious plans have been made for the Media Centre/International Press Centre to be bought by a national media company. There are now major discussions about turning this into a temporary building. The legacy promised a major centre of local employment - we'll probably get a dodgy money-making faith centre or massive tesco. The Handball Court has now been scaled down. This was going to be a fantastic local Community Centre - what are the current plans now? There is talk by Boris Johnson of siting a University Campus 'just south of the Media Centre'. Well - this is where we are supposed to be getting part of Arena Fields returned to a lush green breathing space. I could go on & on about legacy plans been leaked out to the media without the official Legacy Document been issued. Is this meant to soften all our expectations until it comes out in Spring 2009. So - Leabank Square - what is the answer to the question now? Is the end result - an Olympic Park with no relevant legacy to us - it's closest exiting residential neighbours - worth all the noise & dust? Has everyone noticed how well Sunflowers grow here in Leabank Square?! From Lucy's beautiful garden at the entrance - to the stunning handbag garden on the riverside - Sunflowers seem to thrive very well in our Square!! Some very creative residents have come up with a lovely idea. How about having a million Sunflowers growing here next summer? If we all got some Sunflower seeds over the next 5 or 6 months (very cheap from Lidl & B&Q) - then plant them in spring - and stand back & watch!! In the summer - we will be awash in all the shades of yellow as amazing sunflowers bring colour, warmth & vibrancy to our lovely Leabank Square!! Absolutely WELL DONE to all the Mosaic tenants of Leabank Square for setting up their association!! You people are an inspiration to us all!! It is so warming to see so many hard working & diligent residents all volunteering to make Leabank Square a fantastic place for us all to live in. Your association is the first to be created here in Leabank Square & will be paralleled by the rest of us when ours gets set up very shortly. Together - the two associations will have all the influence we need to get the best out of the new & improved management company. No longer will we have to moan about the lack of action - or no maintenance been done. We will have the power to demand more for our unusually high service charge. To all the Mosaic tenants - the rest of us salute your determination & sheer hard graft in having got this far - and look very much forward to working alongside you all - to improve ALL our lives here in Leabank Square!! Arena Fields - in the Olympic Legacy? Those of us in Leabank Square who signed & took the Arena Fields petition - all those years ago now - to John Prescott's office - will be even more worried by how the Olympics are handling our Arena Fields!! For the newer residents - Arena Fields was the beautiful, large, green, luscious park directly over the canal from us - that was stolen from us by Act Of Parliament - to give to the Olympics. But before that - we were trying to get some regeneration going behind Arena Fields - where the old Hackney Dog Stadium and some dodgy religious buildings were. We had a long period of correspondence with the Department for Environment, Transport and the Regions headed by John Prescott, MP. He would not commit to any regeneration for years, delaying & no-commenting for so long that we began to feel that something else was afoot. Then came along an Act of Parliament to take this beautiful park - that was given to the people of London in 1894 - all properly registered as Common Land and Metropolitan Open Space - and for their enjoyment and recreation and that to be "in perpetuity"! Many of our residents in Leabank Square planted trees all around the border with the Hackney Environment Forum (http://clubplan.org/cms/page.asp?org=2673&id=388) - and on their own. Directly opposite Leabank Square there we planted figs, cherries, apples, bananas and a stunning wildflower meadow. All that has been demolished - but we always knew that could happen. 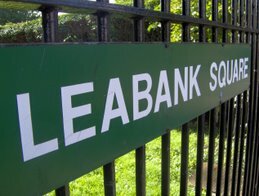 We have been promised that a small part of Arena Fields will be returned to a green playing field - directly opposite Leabank Square - as part of the legacy. The time has come to start signing petitions, and visiting MP's again - in order to make sure that this happens!! Leabank Square must start putting EXTREME pressure on the Olympic Delivery Authority to make sure that this smaller bit of Arena Fields is not lost to ANY type of development! We will be discussing this at the next meeting - and will then start a campaign of action - giving about a hundred suits a very big headache - until they promise to keep their promise!! We are the residents of an inner-city estate in Hackney, London, UK. As we are situated right next to the London 2012 Olympic site, we know for certain that you are going to be a few metres away from us here at the opening ceremony on 27 July 2012. I know that there are a few more important things for you to do in between then & now, but if you could please put a couple of free hours aside on or around that day - to visit us here in Leabank Square - we would love to meet you. Mr Obama, Leabank Square is not a well-off estate, but we will put out the equivalent of a red carpet for you & your family & crew, and would love to invite you to taste some of Real's delicious jerk chicken, or Nadira's tea & scones, and spend a few minutes meeting some of the amazing kids that live here. It would mean so much to us - especially as we never get inspirational visitors like yourself in this part of run-down London. We all know that the Olympics are coming to Hackney, but we feel completely ignored in the run-up - and know that there is a real chance that we will never benefit from the games. If you could come over & visit us - that would be all the benefit our kids need to be inspired for the future. Anyhow, please do the right thing about the international economy just now, otherwise the Olympics might not even be happening. See you in 4 years time! !